This article focuses on best practices for towing a trailer, or vehicle, safely and provides general information and tips that can help you make safe decisions when driving a tow vehicle and trailer for noncommercial, personal use. It should be noted that this information is not a substitute for the technical information found in manufacturers’ towing guides and vehicle owner’s manuals. Its purpose is to provide basic information to ensure your safety and that of your passengers, as well as the safety of other people on the road. While the article does focus on safe practices and safety equipment, it does not cover hitch systems, towing packages, tongue weight, and driving permits. This type of information can be found through other sources, including the National Highway Safety Administration at https://www.nhtsa.gov. Federal law requires trailers to have permanently attached taillights, brake lights, side marker lights, turn signals, and side and rear reflectors. 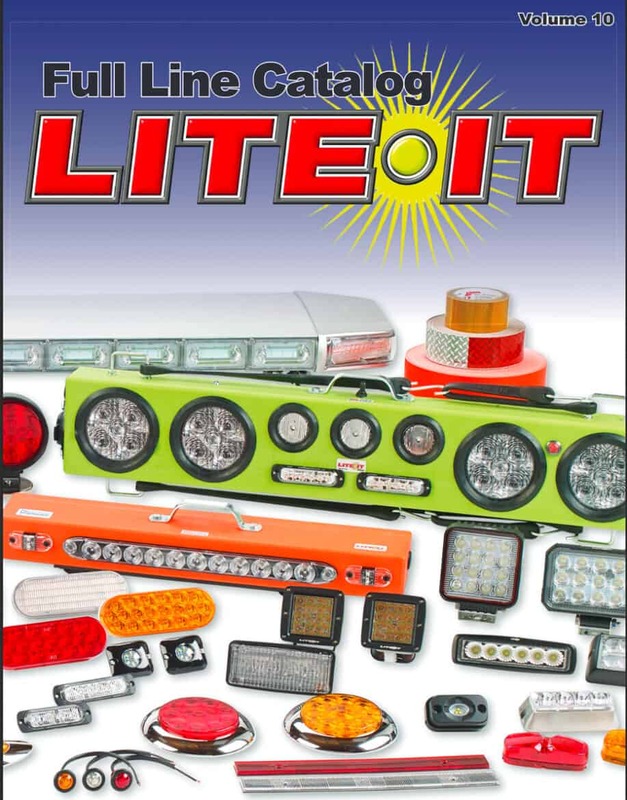 Required Lights for Trailers 80″ or Wider, Less Than 30′ Long, and with a GVWR Greater Than 10,000 lbs. 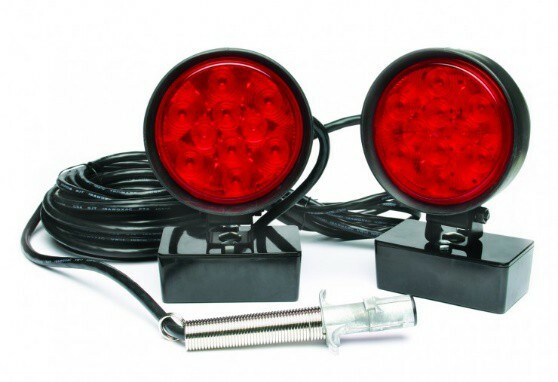 Temporary tow lights are designed for short-term use, and often incorporate a magnetic or suction cup mounting system for locating on a trailer, or on the rear of a vehicle being towed. Temporary tow lights must have tail/stop/turn light functionality, and be easily seen from the rear and sides. A vehicle towed by a car, truck, or RV, can be transported in, or on a trailer that carries the vehicle completely off the ground. Or it can be conveyed using a “car dolly” that carries either the front or back wheels off the ground. Another method is “flat towing” in which case all wheels of the vehicle being towed are on the ground. In the case of a vehicle being towed in or on a trailer, the trailer must be equipped with permanently attached lighting and reflectors as previously described. However, a vehicle towed on a car dolly, or flat towed, must have tow lights (tail/stop/turn) placed on the vehicle so to be easily seen from the rear and sides. This can be accomplished with use of temporary towing lights. The lights typically have power leads connected to the trailer wiring harness plug on the tow vehicle to receive power and signal for tail/stop/turn. Less cumbersome, and easier to use are wireless tow lights, such as the Custer Products S.M.A.R.T. 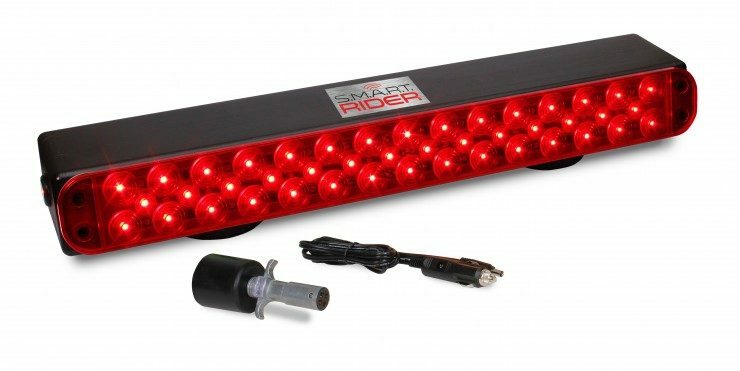 Rider (Simple, Magnetic, Alerting, Radio-powered Tow light). S.M.A.R.T. Rider is powered by a self-contained battery, and receives signal wirelessly. Requiring no leads between the trailer wiring harness plug and the tow light, makes installation simple and quick. Temporary lighting can also be used when towing trailers that are not equipped with lighting, or that have permanent lighting which is inoperative. Again, wireless tow lights provide solution for a quick and simple installation. The regulations for using temporary lighting in these situations can vary from state to state. It is recommended to check with your local motor vehicle administration to verify their use. Federal law requires trailers to have taillights, brake lights, side marker lights, turn signals, and side and rear reflectors. Some trailers also have backup lights. To provide power to these lights, a four-way (or more) connector is hooked into the tow vehicle’s electrical system. Many tow vehicle manufacturers offer a 7-way connector that may include an electric brake signal, power supply, and backup lights, in addition to the typical four functions. Note: You must ensure that the signals on the electrical connector of the tow vehicle match the electrical connector of the trailer. Because the wiring systems of many tow vehicles use separate wires for turn signals and stop lights, you may need to purchase a taillight converter. This converter will combine these wires so that they can be connected to the trailer lighting system. Most factory-installed towing packages include a trailer wire harness that will perform this function if required. If you tow more than one type of trailer, you also may need to purchase an adapter to accommodate differences in the wiring systems. Wireless tow lights, such as Custer Products’ S.M.A.R.T. Rider, utilize a transmitter that plugs into the tow vehicle’s wire harness plug. Standard is a 4-pin plug connector, while a 7-pin plug connector is available. All your trailer tires should be the same type, size, and construction—do not mix bias belted and radial tires. In selecting tires for your trailer, buy the size, type, and load range found on the trailer’s certification label or in the owner’s manual. Keep in mind that tires have a load rating that indicates the amount of weight they can carry safely. 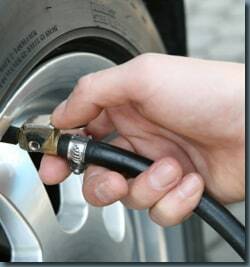 As with your tow vehicle, always maintain proper tire pressure and replace worn tires. Remember—your tow vehicle tires may require a higher tire pressure for towing, especially heavy loads. Most trailers and tow vehicles should be level (parallel to the ground) during travel. Check the instructions from your trailer manufacturer to make sure this is correct for your combination of vehicles. States and municipalities may require special permits and licenses based on the size and weight of your trailer, especially if it is over eight feet wide. Some states require additional equipment for the tow vehicle, such as side- and rear-view mirrors. Inquire at your local motor vehicle administration to find out what requirements affect you. If you plan to travel in another state, don’t forget to check its requirements also. For example, surge brakes may not be legal in some jurisdictions. In addition to licenses and permits, there may be weight, height, and width limits for using certain roads, bridges, and tunnels. Also, be aware of restrictions regarding the transport of propane gas and other volatile gases or fuels in tunnels. And don’t forget to contact your insurance company to make sure you have the proper coverage. Check and correct tire pressure on the tow vehicle and trailer. 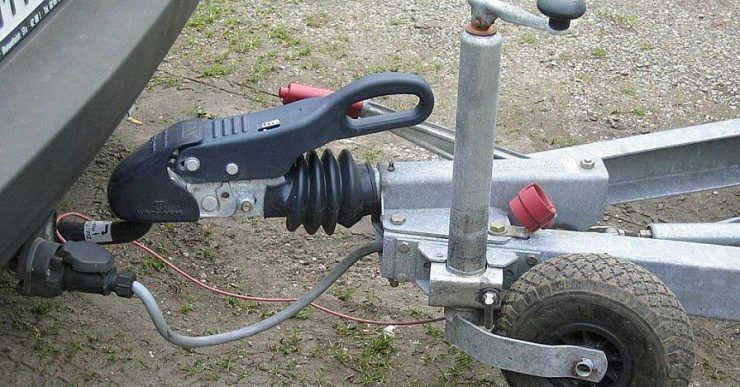 Be sure the hitch, coupler, draw bar, and other equipment that connect the trailer and the tow vehicle are properly secured and adjusted. Check that the wiring is properly connected— not touching the road, but loose enough to make turns without disconnecting or damaging the wires. Make sure all running lights, brake lights, turn signals, and hazard lights are working. Take time to practice before driving on main roads and never allow anyone to ride in or on the trailer. Before you leave, remember to check routes and restrictions on bridges and tunnels. Consider the following safety tips each time you drive with a trailer. Use the driving gear that the manufacturer recommends for towing. Drive at moderate speeds. This will place less strain on your tow vehicle and trailer. Trailer instability (sway) is more likely to occur as speed increases. Avoid sudden stops and starts that can cause skidding, sliding, or jackknifing. Avoid sudden steering maneuvers that might create sway or undue side force on the trailer. Slow down when traveling over bumpy roads, railroad crossings, and ditches. Make wider turns at curves and corners. Because your trailer’s wheels are closer to the inside of a turn than the wheels of your tow vehicle, they are more likely to hit or ride up over curbs. To control swaying caused by air pressure changes and wind buffeting when larger vehicles pass from either direction, release the accelerator pedal to slow down and keep a firm grip on the steering wheel. Allow considerably more distance for stopping. If you have an electric trailer brake controller and excessive sway occurs, activate the trailer brake controller by hand. Do not attempt to control trailer sway by applying the tow vehicle brakes; this will generally make the sway worse. Always anticipate the need to slow down. To reduce speed, shift to a lower gear and press the brakes lightly. When passing a slower vehicle or changing lanes, signal well in advance and make sure you allow extra distance to clear the vehicle before you pull back into the lane. Pass on level terrain with plenty of clearance. Avoid passing on steep upgrades or downgrades. If necessary, downshift for improved acceleration or speed maintenance. When passing on narrow roads, be careful not to go onto a soft shoulder. This could cause your trailer to jackknife or go out of control. Downshift to assist with braking on downgrades and to add power for climbing hills. On long downgrades, apply brakes at intervals to keep speed in check. Never leave brakes on for extended periods of time or they may overheat. Some tow vehicles have specifically calibrated transmission tow-modes. Be sure to use the tow-mode recommended by the manufacturer. Put your hand at the bottom of the steering wheel. To turn left, move your hand left. To turn right, move your hand right. Back up slowly. Because mirrors cannot provide all of the visibility you may need when backing up, have someone outside at the rear of the trailer to guide you whenever possible. Use slight movements of the steering wheel to adjust direction. Exaggerated movements will cause greater movement of the trailer. 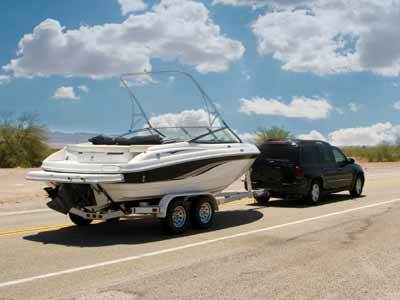 If you have difficulty, pull forward and realign the tow vehicle and trailer and start again. Try to avoid parking on grades. If possible, have someone outside to guide you as you park. Once stopped, but before shifting into Park, have someone place blocks on the downhill side of the trailer wheels. Apply the parking brake, shift into Park, and then remove your foot from the brake pedal. Following this parking sequence is important to make sure your vehicle does not become locked in Park because of extra load on the transmission. For manual transmissions, apply the parking brake and then turn the vehicle off in either first or reverse gear. When uncoupling a trailer, place blocks at the front and rear of the trailer tires to ensure that the trailer does not roll away when the coupling is released. An unbalanced load may cause the tongue to suddenly rotate upward; therefore, before uncoupling, place jack stands under the rear of the trailer to prevent injury.